Heavy-duty packaging tape is ideal for box sealing, splicing and other demanding packaging applications. 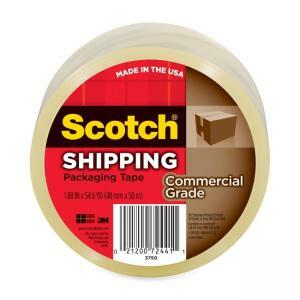 Strong adhesive and tape backing are designed to keep box seams closed during rough handling. Hot melt adhesive seals out moisture, dust and dirt and resists splitting. Use tape as a refill for 3M Scotch DP300-RD Hand Dispenser, H-180 Dispenser, or ST-181 Pistol Grip Dispenser. Tape meets U.S. Postal Service regulations and courier regulations for standard packages.